Story: In this pulse-racing, mind-bending action thriller, Ethan Hunt confronts the toughest villain he's ever faced - Owen Davian, an international weapons and information provider with no remorse and no conscience. The film is co-written and directed by J.J. Abrams, who brings his unique blend of action, character, comedy, and drama to the franchise. The millions of loyal viewers of Abrams's landmark creations, the television series "Lost" and "Alias," know what to expect: an enthralling, intricate story with an unexpected and arresting payoff that satisfies on every level. 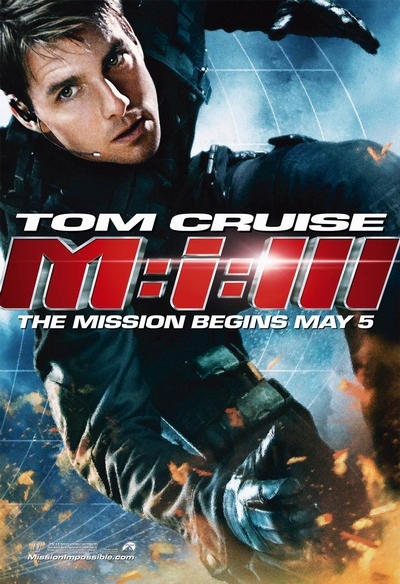 With "M:i:III," Abrams and Cruise turn the spy thriller on its ear as they hark back to the best aspects of the original TV series that inspired the films - a well-connected team of agents centered around a bold and heroic leader, the most exciting action stunts imaginable, and elaborate twists and turns that keep you on the edge of your seat. "M:i:III" is the action movie audiences have been waiting for.